On Monday, we went to Roxbourne to play our penultimate game of the season. We were looking forward to the game until we saw the pitch… it was extremely muddy and full of puddles due to the bad weather! Despite this, we still felt pretty confident. We scored early on after a fantastic goal from Joseph Evans, however Roxbourne equalised soon after. Although it was the first goal we have conceded in the league this year, we stayed positive and Edward Mitten scored to put us 2-1 up. Roxbourne continued to put pressure on us and we conceded again just before half time making it 2-2. We had a great team talk at half time and felt confident that we could still win the game. We continued to battle and Edward scored two more goals which meant he got his first hatrick for the school team. We were then awarded a penalty, Verrell stepped up and scored making the final score 5-2. 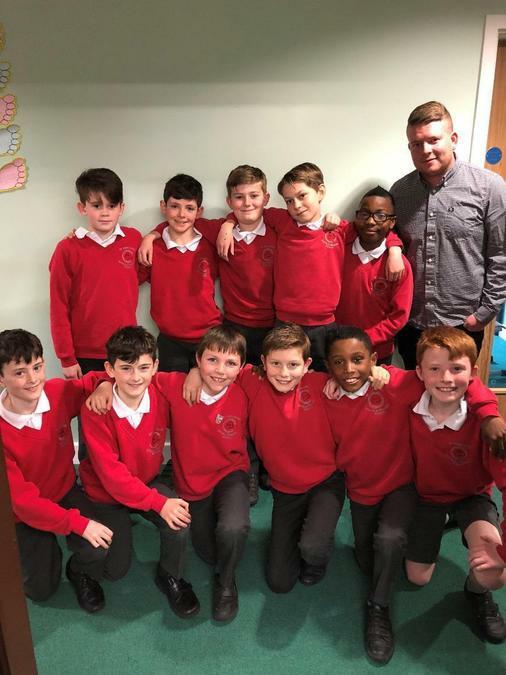 Well done to: Cian McGrath-Brown, Morgan Ducran, Billy James, Alex Wilson, Harry Perkins, Alex Hipwell, Edward Mitten, Pierce Long, Joseph Evans, Verrell George, Zach Moritz and Daniel Evans. A special well done to Edward Mitten and Harry Perkins who were both selected as Man of the Match. Thank you to Mr Kelly and Mr O’Brien for coaching us, Mr Betts for driving the mini bus and our parents for coming to support us and for washing the filthy kits! We also received great news this week, we found out that we have finished in the top two of our group and we have now qualified for the play-off’s which we will play on March 26th. Wish us luck!